These Mini Cheesecakes are thick, smooth and creamy, with a little tang from some sour cream! 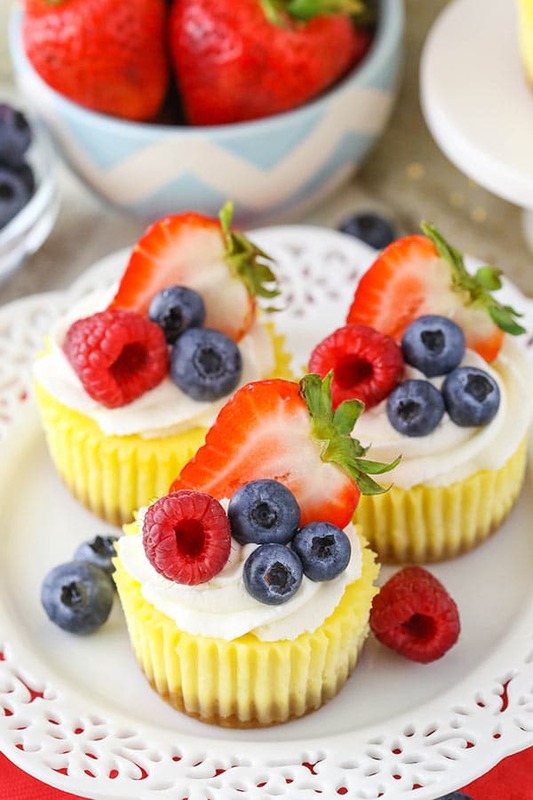 They have a vanilla wafer crust and are topped with fresh whipped cream and berries for a classic little treat! Who doesn’t love a good mini dessert? They are easily shareable and transportable. They’re easy to make (usually). And they feel so much more guilt-free than your average full-sized treat. I have loads of mini cheesecake options, but didn’t have a simple vanilla one here for you yet, so today I am sharing my classic vanilla mini cheesecake with you! Perfect for any occasion and easy to change up! 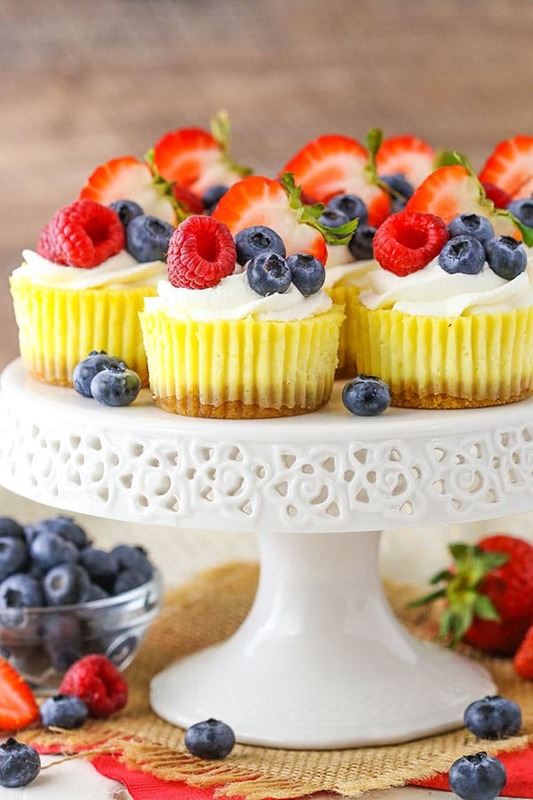 So how do you make mini cheesecakes? Well let’s start with the crust. I used a vanilla wafer cookie crust by grinding up the cookies in a food processor. I love the extra bit of sweet and vanilla that the cookies give the mini cheesecakes, but you could definitely swap the cookie crumbs out for graham cracker crumbs without making any other changes. Both are totally classics in my mind and so yummy! Next up is making the filling. Just a handful of ingredients are used and you likely have most of them handy already. You’ll want your cream cheese to be room temperature to start with so that it doesn’t get all lumpy in your batter. Add some sugar for sweetness and flour for texture and mix it all together! Next up is the sour cream and vanilla extract. The sour cream softens up the texture of the cheesecake and lends some moisture, while also adding a nice pop of tangy flavor. And then of course the vanilla is totally necessary and adds flavor. Next up are the eggs to bind everything together and add some nice richness to the cheesecake. 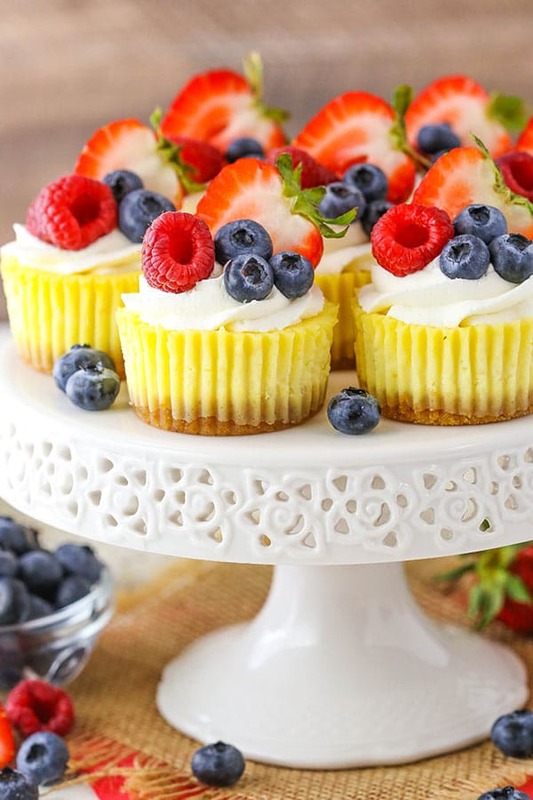 How do you bake mini cheesecakes? Unlike a full-sized vanilla cheesecake, mini cheesecakes do not require a water bath. Score! I bake them right in a cupcake pan with cupcake liners. They also don’t need nearly as long to bake as a full-sized 9 inch cheesecake. Instead of taking almost 2 hours to go through the baking and cooling process, these take about 40 minutes. Much more friendly with your time for those days when you need cheesecake more quickly. Once the cheesecakes are baked, they can be chilled in the fridge. 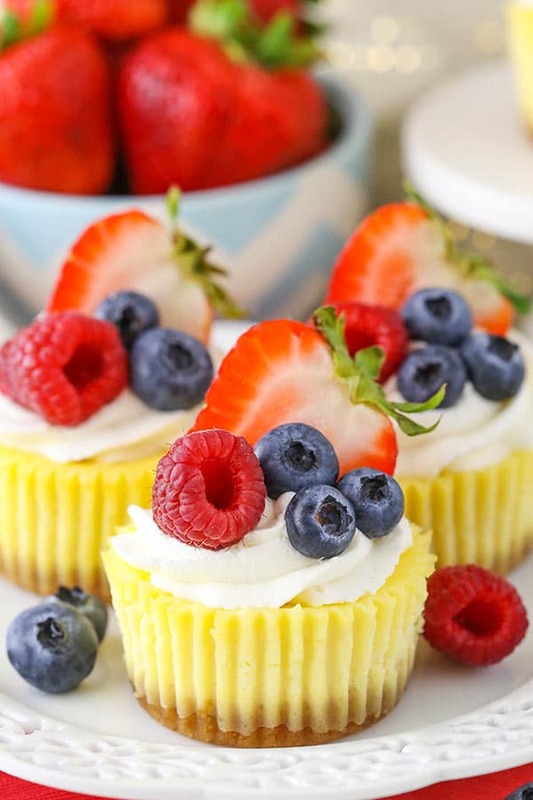 I served these with a topping of fresh whipped cream and berries and oh my goodness – so good! 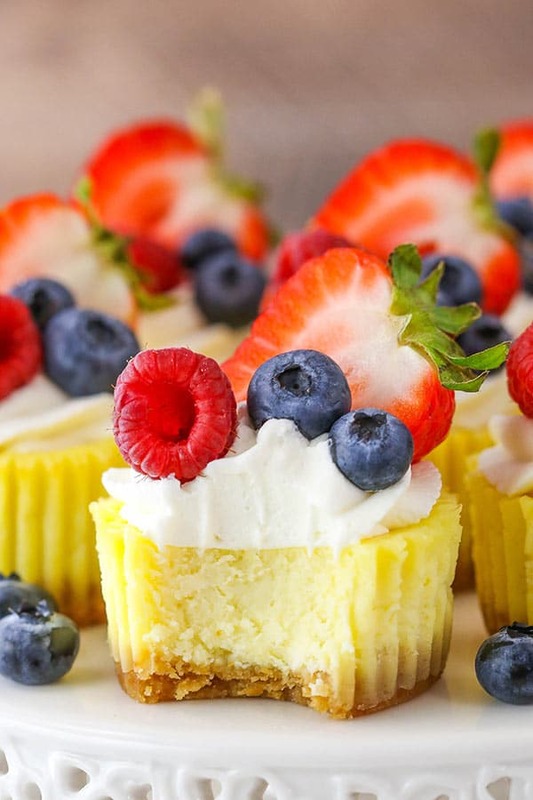 These little mini cheesecakes are so classic and simple, but pack a LOT of flavor! Can you freeze mini cheesecakes? I get a lot of questions about freezing deserts, so I decided to test these out in the freezer. I froze them in a tubber ware container – some wrapped before going into the container and others unwrapped. After being frozen for about a month, I gave them a try. Delicious still! It didn’t seem to make a difference if they were wrapped prior to going into the container or not. They were slightly firmer around the edge than when they were fresh, but marginally. I also froze some with the whipped cream on them already and it froze and defrosted great. I just wouldn’t recommend freezing them with the fruit on top. Juices can run and fruit can get a little soggy after being thawed. 1. Preheat oven to 325°F (162°C). Add cupcake liners to a cupcake pan. 2. Combine the vanilla wafer cookies crumbs, sugar and melted butter. Divide the mixture between the cupcake liners (about 2 tablespoons per cup) and press into the bottoms. 3. Bake the crusts for 5 minutes then remove from oven. Allow to cool while you make the filling. 4. To make the filling, reduce oven to 300°F (148°C). In a large bowl, mix the cream cheese, sugar, and flour until combined (Use low speed to keep less air from getting into the batter, which can cause cracks). Scrape down the sides of the bowl. 5. Add the sour cream and vanilla extract. Beat on low speed until well combined. 6. Add the eggs one at a time, beating slowly and scraping the sides of the bowl after each addition. 7. Divide the filling between the cheesecake cups until the cups are mostly full. 8. Bake the cheesecakes for 15 minutes, then turn off the oven and leave the door closed for another 10 minutes. 9. Crack the oven door and allow cheesecakes to cool for 15-20 minutes, then put in the fridge to finish cooling. 10. When cheesecakes are cooled, remove them from the pan. 11. To make the whipped cream, add the heavy whipping cream, powdered sugar and vanilla extract to a large mixer bowl fitted with the whisk attachment. Whip on high speed until stiff peaks form. 12. 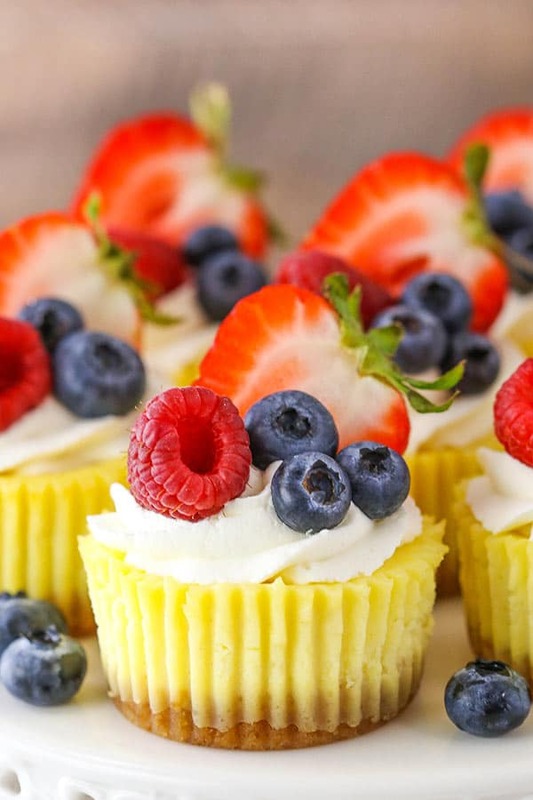 Pipe the whipped cream onto the tops of the cheesecakes and top with fresh fruit. 13. Refrigerate until ready to serve. These look sooo cute and summery!! Thanks for sharing! ???? Thank Lila! I hope you get a chance to try them! A regular sized cupcake pan. They are “mini” because they aren’t a full sized 9 inch cheesecake. Good Evening Ms. Lindsay, Interested In Knowing Do You Cater? I don’t, but thank you! I assume this recipe makes 12 mini cheesecakes – standard cupcake pan? Thanks! Yes, you can find the amount it makes in the pink recipe card just under the title and the pan I used is linked in the first instruction. Thanks Diane! I tried this recipe using a non-stick mini cheesecake pan. The recipe made 18 mini cheesecakes. The instructions, as they are written for the cupcake pan cheesecakes, worked perfectly. I’ve tried many recipes and this one works the very best with the non-stick mini pans. Can you use cornstarch instead of flour to make them.gluten free? I would also use gf vanilla wafers. Thanks! Can these be made the evening before needed and kept refrigerated, of course. Thank you. 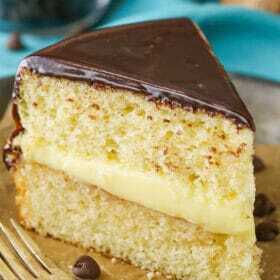 I have just pinned these beautiful cheesecakes! New to your site but I am in love. Your photography is incredible! So crisp and clear. I am now officially craving cheesecake! Thank you! I”m so glad you’ve enjoyed the blog! Made them with a graham cracker crust, since that’s what I had ingredients for. Delicious! Heaven in a bite! Hard to stop eating! I made this recipe in a mini-muffin pan size and they are perfect for finger food desserts at a party. I topped with a fresh blueberry. Love all your recipes! Great idea! 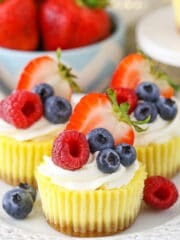 I’m glad you enjoyed the mini cheesecakes and recipes! Can you make them without the cupcake liners and just prep the pan to not stick? As long as she uses a good non-stick spray it should be ok. The liners are also nice for handling when you remove them so stuff doesn’t stick to your fingers. I hope you enjoy! Best Mini Cheesecake recipe! My husband needed a dessert for a work party so I doubled the recipe to get 24 beautiful little cheesecakes. Sooo easy and absolutely delicious and creamy. I used canned strawberry pie filling for the topping. The topping options are truly endless. I love recipes that have individual servings already in place so nothing has to be cut or served. Lindsay, everything you make is just so beautiful! Baking is my passion (and stress reliever) and I love being able to create something people enjoy. All of your recipes are perfectly written and easy to follow. I love that you list the ingredients in grams as using a kitchen scale helps to ensure you’re using the correct amount of each ingredient. So glad to hear that! Thanks Julie! This recipe is amazing! I doubled the recipe for a large gathering and it did not disappoint. Even my non dessert lover friends were going for seconds. So easy and so pretty. Cheesecake is so creamy and the fresh whipped cream was the perfect, light topping. Will definitely be making these again. 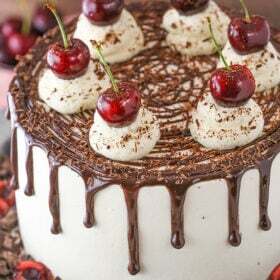 I’ve made ones similar to this but wasn’t crazy about the taste if the cheesecake (didn’t taste sweet enough) so I’m looking forward to trying this recipe! The other recipe called for spraying the cupcake liners with pam. Is that not needed? I want to remove the liners prior to serving. You shouldn’t need to spray the pan if you are using cupcake liners. If you don’t want to use the liners, it should be okay as long as you use a good non-stick spray. The liners are nice for handling when you remove them so stuff doesn’t stick to your fingers. I hope you enjoy! Can you put the whipped cream and fruit on the night before? Will the whipped cream hold up? Thank You for sharing it. When I made them the first time, it was my first time on this site. Wonderful! I’m so glad you all enjoyed! Hi there! Just wondering what kind of liners you use (silicone, paper, foil)? And do you remove them yourself before serving? I use paper liners. You could remove them or leave them on – really a preference. I’d probably leave them on, just because it’s a little cleaner and easier to pick up/transport. Hi would you happen to know the nutrition information on these? I’m dieting now, and love cheesecake. These would be a great evening snack! Thanks! I don’t, I’m sorry. There are a lot of online calculators though that might be helpful. Made these Sunday to test them out before making a batch for a fundraiser! May I say the best ever and my coworkers loved them also! How long will the whipped cream stay before breaking down? I am making these for a bridal shower and was wondering if I piped the whipped cream in the morning would it last until the afternoon? Yes, as long as you use the full amount of powdered sugar to stabilize it, it’ll last just fine.